Partnership (2): Marianne Emily MATCHETT  on 28 Oct 1887 in Queensland Aust. Arthur set sail with his brothers in steerage on the "Young Australia" for Brisbane Queensland on the 12 April 1869 arriving on the 13 July 1869. He was 16yrs old. It is not known when Arthur returned to England and took up Holy Orders. Mr Arthur Cowper Julius was educated in their school from June 1867 to March 1869. I have much pleasure in stating that during the whole of this time he was remarkably steady and well conducted. For a considerable portion of the time he was under my own immediate tuition and always gave me perfect satisfaction in respect of his application to and progress in his studies. I entertain a great regard for him as a singularly well principled young man. Second Master at Felsted Grammer School, Essex. Formerly Scholar of Brasenose College, Oxford. Arthur Cowper Julius of full age bachelor gentlemen of Southery father Archibald E. Julius Clerk in Holy Orders to Alice Brown of full age spinster of Southery father Thomas Brown gentleman. Signed by both in the presence of Ellen Amie Skilton, Joseph John Brown, Florence Brown, Blanche E. Julius, Fanny M. Julius. By licence by Archibald E. Julius. 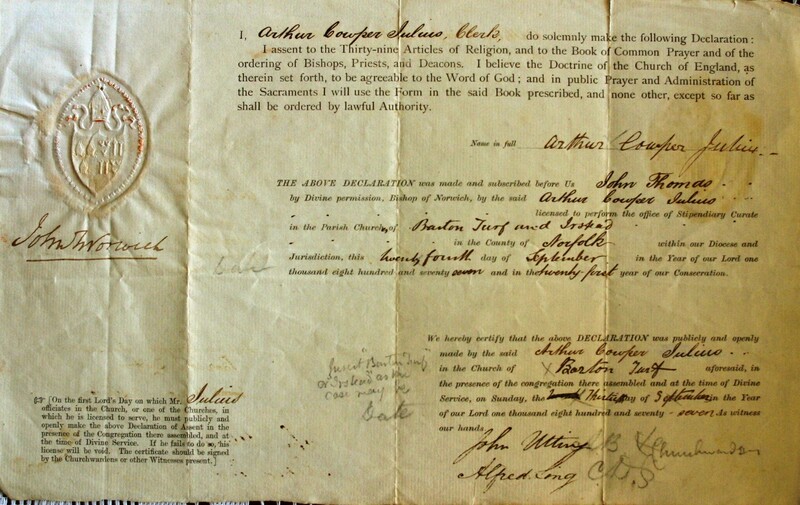 25 Aug 1878 - Arthur baptised his daughter Frances Eleanor as Curate of Barton Turf NFK. A. C. Julius Lit Pr 1879 curate Coddenham, Needham, Suffolk. On Sunday afternoon the Rev. A. C. Julius, curate of Crowfield, preached his farewell sermon. The rev. gentleman has been preferred by the Bishop of Tasmania, (the Right Rev. C. H. Broomby D.D.) to the parish and district of Brighton, in Tasmania. Mr Julius has suffered considerably from ill health while he has been at Crowfield, and it is hoped that he will be better under another climate. The rev. gentleman's loss is deeply felt in Crowfield and the neighbourhood. Besides being a good preacher he has made himself generally esteemed by his genial manner and the kind interest he has manifested in his parishioners. Every worthy object has had his hearty support, and especially has his sympathy been extended to the Village Club, which, under his inspiriting influence, has passed the best period of its history. And Mr Julius will not go away without proofs of the admiration and respect in which he has been held, for the people of Crowfield have presented him with a beautiful silver tea and coffee service and salver, while Coddenham, with a spontaneity of generosity which enhances the value of the gift, has contributed towards getting a handsome private communion service. On Sunday afternoon, therefore, when Mr. Julius preached his last sermon, the little church at Crowfield was crowded, and even filled long before the hour for commencing service, and many hearers were affected by the solemn farewell which their beloved pastor bade them. Mr Julius took for his text Hebrews xii., 27, " And this word, Yet once more, signifieth the removing of those things that are shaken, as of things that are made, that those things which cannot be shaken may remain". Arthur arrived in Hobart, Tasmania in 1881 on the sailing ship "ETHEL" with wife and four children. The passage took 6mths because ship blown off course in The Roaring Forties. Arthur was a bad asthmatic. Arthur Cowper Julius. Allora Queensland Australia. Deacon 1877; Priest 1879 Norwich. Incumbent of Allora, diocese of Brisbane 1885; formerly curate of Barton Turf Norfolk 1877-79; Crowfield, Suffolk 1879-80, Coddenham, Suffolk 1880-81; incumbent of Gayndah, Queensland 1883-85. 1887. Arthur Cowper Julius, Church of England is recorded as Registered to Celebrate marriage, he is resident in Allora Queensland in the Registry District of Darling Downs Central. Deaconed 23 Sept. 1877 Norwich. Priested 8 June 1879 Norwich. Curate of Barton Turf Norfolk 1877-79. Curate of Crowfield Suffolk 1879-80. Curate of Coddenham Suffolk 1880-8. Vicar of Gayndah Queensland 1885. Vicar of Allora Diocese of Brisbane 1885-87. Arthur then left his wife and family in mysterious circumstances. The following letter from his father to his brother Percy indicates why he wished to remain untraced. It is only quite recently that I have been told of Arthur's most disgraceful conduct poor Alice was a good and most excellent wife to him, so that he has not a shadow of excuse for his disgusting conduct. I think that in one of your letters to Lucy you say that you do not think that it would be just that Arthur at my death should have anything left to him but that something should be done for Alice and her children; now in all this I perfectly agree, but there are difficulties in the way, for as I have often told you the whole of my insurances and your dear mothers property are all settled upon her children in what proportion I please so that I cannot in my Will leave anything to Alice or my grandchildren I have consulted my Lawyer about the matter and the only thing that I can do is this [that is if you will agree to it] that you will of course have your share absolutely, i.e. you can do what you like with it; I will leave you an additional sum which I wish you to invest in your own name and to give the interest to Alice and her children, I have such perfect confidence in you that I know you will carry out my wishes. I fear that Arthur even after all that has occured will persuade Alice to give the money to him he will I know get hold of it if he can, so if you find she does give it, or part of it to Arthur tell her that, in that case you will not pay her the interest and then keep it yourself and if things go well with her and that she has sufficient for herself and the children to live comfortably upon then you may take the money for yourself, I am quite sure you will act justly and honestly towards them. I shall be glad to hear what you think of this plan as soon as you can; also can you let me know where and what Arthur is doing, and if he is still living with that woman, why does Alice not get a divorce? He will if possible keep a hold upon her I cannot possibly send her any money at present as every thing is very bad in the old country at present my living this year is only L311 and next year L95 it will be still less; dear old Jane sends her fond love to "her boy" and all your party. I cannot write more now and will only add my fondest love to yourself and your dear wife and all the dear children. The above arrangement above was executed in 1895, see letter in: Notes on Percy Julius. "I know that Arthur worked in a Sydney university library and changed his name to Davis or Davidson". Family lore has it that Arthur had an affair with servant and had a female child by her, after he left Alice he is said to have opened a home for homeless boys. Re Arthur Cowper Julius - Beth Dicks (his granddaughter and daughter of John Julius, youngest of Arthur Cowper's family, told me, that Arthur Cowper suffered badly from asthma and took heroin for the complaint, he evidently had a nurse when he was ill, and that he "went off" with the nurse. Betty Cottam told me Arthur Cowper had a big row with his brothers and went off to Sydney and changed his name to Davidson. He married a Marianne Emily Matchett who had a school in Sydney. There was a son, Jeffrey Villiers who died on his first birthday. A daughter Constance was born 1890 died 1979. Constance married a Fred Beaver of Bank NSW ? And they lived at Murwillumbah when Dad (R.H.J.) went to visit them (about 1927) at the request of his mother in England. Since then we have known this family, Constance and Fred had 4 daughters Margaret (now Morgan), Betty (now Cottam), Helen and Kathie, so these 4 are the granddaughters of Arthur Cowper Julius. The above information from Family Jottings, Susan Julius and some research in Ancestry Australia, reveals the fate of Arthur Cowper Julius who left his first wife & family, and as far as is known turned his back on his vocation. He did in fact marry, it would seem bigamously, Marianne Emily Matchett on 28 Oct 1887 in Queensland under the name of Alfred Withers Davison (Davidson). Alfred (Arthur) had surviving issue as stated above, Constance Mary Davidson who married Frederick Bathurst Beaver, they had issue 4 daughters. Tying this deception together through the christian names used, Arthur Cowper, then Alfred Withers, then John by his death in 1918, is his death registration which shows his parents as Archibald & Charlotte, while he shares a grave and headstone with Marianne Emily. On file a poor copy of a sermon preached by Arthur first in Coddenham SFK 28 Sept 1879 then at several other Parishes in England including Crowfield and Southery, then at St Georges in Hobart at the morning service on 18 Sept 1881 finally in the afternoon at Birkwood Queensland (nr Harrisville) on Sept 23 1888. He delivered the sermon some 26 times. His text was Psalm 77 Verses 19 & 20. 1. Census: England, 8 Apr 1861, Church St Southery NFK. Arthur is recorded as a son aged 8 born Myland ESS.